"Liverpool is a religion. And Anfield is our place of worship." And so begins part one of the extraordinarily candid documentary series called 'Being Liverpool', with never-before-seen footage that puts a lump in your throat if you're a die-hard Liverpool fan. And even if you're not. This six part series gives fans a true insight into the club, the history, the players... including access to the players' homes. Watching it with my husband a few nights ago [he's an extreme aficionado and his shrine to Liverpool in his office is testament to that] we were agog that we were able to 'meet' Steven Gerrard's beautiful family, and see his home. Likewise, the viewer meets several other players in their homes, and even new manager Brendan Rodgers gives us the ol' home tour. The best part [apart from hearing actor Clive Owen narrating the entire thing]? Australian viewers are seeing this doco unfold at the same time as UK viewers. It's brand new - with footage as recent as May 2012 - and charts not only the rich history of the football club, but the hopes they carry for all the 'scousers', as well as dedicated Liverpool fans worldwide. It really is unmissable. It had me glued. 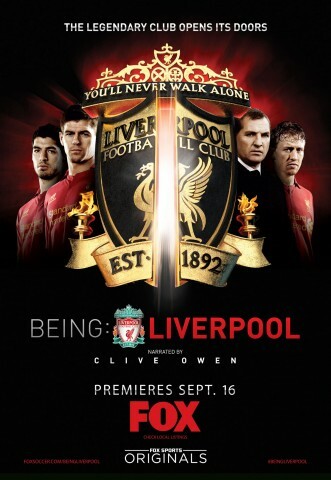 Australian viewers can catch 'Being Liverpool' from episode one [repeat] on Saturday night at 8.30pm, on Fox Sports1, and then each Saturday thereafter.